I was looking at pins on Pinterest the other day and was amazed by the amount of creativity and inspiration available on the site. One of the types of projects that caught my eye was the unusual crafts people made out of toilet paper rolls. I was amazed. There were wall hangings that looked like iron, paper flowers, little animal sculptures, and even amazing miniature art cut inside of a cardboard roll. Wow!!! I knew I had to try making something out of cardboard tubes. 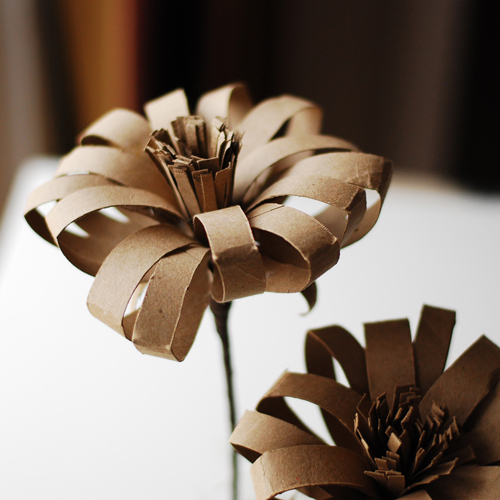 I like paper flowers, so I decided to give cardboard tube flowers a try. I am quite pleased with the results. This project is super easy, super cheap and fast to make. 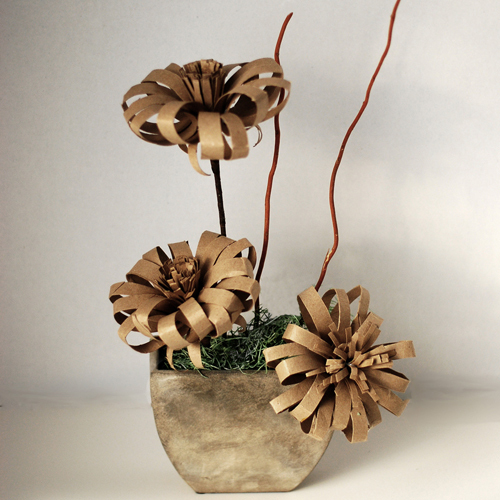 Follow the tutorial below, and soon you will be enjoying your recycled flowers. Gather supplies needed for the project. Flatten toilet paper roll as in the photo above. Cut the top and bottom of toilet paper roll. You will now have two squares. Cut the stems for the center of flower about 1/8 wide as in the photo. 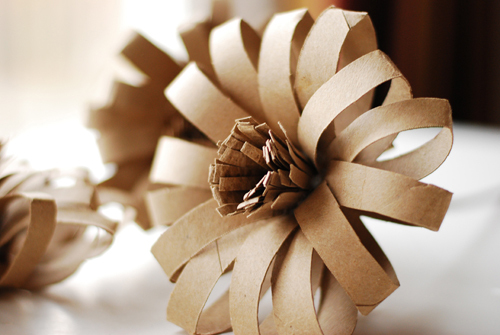 Roll the first piece to form the flower center and glue edge with hot glue to stabilize and keep from unrolling. Continue with the second piece. Roll and the glue the edge so that this piece does not unroll. Glue the bottom of the flower center with a large amount of hot glue. Wait for it to dry. Cut 16 circles about 1/2 inch wide from the gift wrap tube. Clip the bottom of each circle to form a V shape, without cutting the circle open. This will give you extra room to glue the circles onto the center of the flower. Glue eight circles to the flower center as in the photo above. Glue the next eight circles with hot glue in between the “petals” already glued into place. Insert the bamboo skewer through the bottom of the flower to form the stem. Cut a piece of cardboard tubing about 3″ by 4″. Cut 6 1/4 inch petals from this piece of cardboard. Use a pencil to curl and roll each petal edge. Roll into a tight roll to form flower sepals. Thread through the bamboo skewer to the bottom of the flower, and attach with hot glue. Wrap the skewer with brown floral tape. Wrap the floral tape one or two times more to give the stem a little more width. A word of caution: Be careful when using a hot glue gun. The glue reaches extremely high temperatures, and it is easy to burn your fingers and hand. Always use common sense when working with hot glue.